In July I scaled back my choices from Love Lula because I was taking time out to recover from surgery and wanted to ease my blogging workload. Let me talk you through what I have been using. 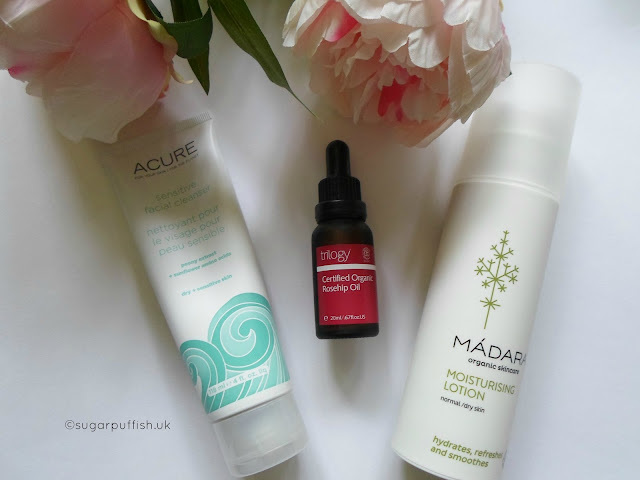 Acure’s hair care range is a cult product among US bloggers and now we have the chance to try products through a UK stockist. As I’m happy with my hair routine, I thought I’d try Acure skincare and I always feel that a cleanser is a good place for me to start. The Acure sensitive facial cleanser has a silky thick texture which is excellent for massaging across the face. I find it works better on damp skin so I hold a wet flannel to my skin before applying (I hate splashing water). It can be rinsed off but I choose to use a damp flannel. The aroma is pleasant and I’m pretty sure my skin likes this product because it currently feels nice and soft with no visible signs of irritation. It’s fair to say I’m enjoying using this Acure cleanser. I’m happy to recommend and would re-purchase. Rosehip is one of my favourites ingredients and I feel it works well for my skin type. I picked rosehip oil specifically to use on my surgery wounds because its known for helping with scarring and stretch marks. I’m applying a couple of drops of oil every evening. I am someone who easily bruises and I’m often left with red marks long after pimples have disappeared so my skin needs extra help to heal. Of course I’m not expecting miracles over night but I’m seeing improvements as the weeks pass. Trilogy is a reputable brand so I trust the quality of this oil. You’ll have noticed that I’m slowly working my way through every Madara product that is free from linalool. I’ve been so impressed with products I’ve tried so far and the moisturising lotion was next on my list. At first it took me ages to get the pump to dispense product and for a moment I thought it was broken but eventually I got it to work. I would describe the aroma as herbal and I have mixed feeling about it. I’ve taken to using this lotion on my legs after shaving as I can often suffer from dryness and irritation on this part of my body. The Madara moisturising lotion has a good texture, not too heavy so ideal for warm days but still gives hydration to my skin. I’m happy with the results and would recommend. Disclaimer - affiliate link & I'm part of the Love Lula Blogger Programme and can select PR samples each month, I am not obligated to review and all opinions are my own.